Kate Bishop is in a world of trouble. In the wake of several inexplicable and brutal murders, Kate is thrust into a police inquiry that reveals shocking family secrets. Suddenly exposed to a shadowy network of global evil, her life takes a dramatic turn with the arrival of Jack Raines, an author with a mysterious past, who says he has the answers to her questions. What's more, he suggests that Kate herself might be the solution. But hot on their heels are a force of super-predators, vicious and bloodthirsty killers who will stop at nothing until Kate and Jack are eliminated. Like Jack, they've realized just how special Kate is, and now she's marked for death. 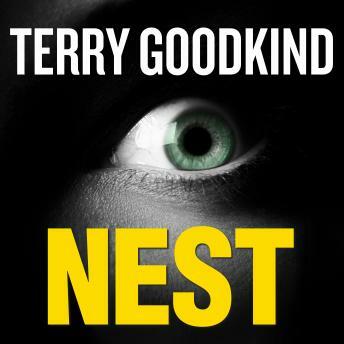 An explosive mix of action and suspense, Nest is a landmark new novel from worldwide bestselling author Terry Goodkind, and a complete reinvention of the paranormal thriller. Travel with Goodkind on a dangerous journey to the back alleys of the darknet, to the darkest corners of our minds, and to the very origins of what it is to be human, a place few have ventured and fewer still have survived. Great story, a different type of book from Terry that was as good as the rest. Enjoyed it very much.